Pumps are a large part of our enjoyment of water. They circulate water so that it can pass through filters for clarification. They push water through heaters so that it can gain heat to make us more comfortable. Pump’s movement of the water helps to mix the chemicals that we add for sanitation and cleanliness. Pumps can be used to remove water from unwanted places to make our life easier or to prevent flooding which makes our lives safer. There are pool pumps for both above ground and built in pools. There are spa pumps for every kind of spa and some spas have more than one pump to do the work. There are circulation pumps that just move water around. There are bath pumps to make your indoor bath tub like a spa for relaxation. There are submersible pumps that can be used to remove unwanted water such as from rain that accumulates on the top of your pool or spa cover. They can be used to remove water from any flooded area. There are booster pumps that are added to your system so that you can have less work by allowing a robotic pool cleaner to do the work for you. Bath pumps come in different styles depending on how they are controlled. Many bath pumps use an air switch usually mounted on the tub, which turns the circulation on or off. Some of these, timeout or stop after a certain period of time passes. Other bath pumps are controlled by an electric switch or timer, usually mounted on a nearby wall. When choosing a bath pump you can narrow your search by horsepower (hp). The information on the horsepower is usually on a tag attached to the pump. Circulation pumps are usually used in hot tubs to circulate the water throughout the tub without making the water rush around as it does when the jets and air are included. They help to warm the water by providing the heater with necessary flow and keep the chemicals mixed and the water filtered. They use less power than the larger spa pumps and thus are more energy efficient. You can also use horsepower to narrow your search for the right circulation pump. Use your piping size for suction and discharge and the position of the discharge and suction connections on your pump to pick the one you need. 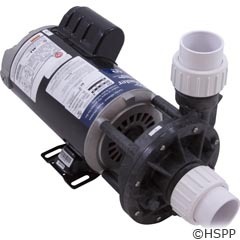 Pool pumps come in several different sizes for the many sizes of pools there are. Once you determine what size pool pump you need your can narrow down your search by the size of the piping going to and from the pump. A spa may have more than one pump. Check the tag on the pump that you need and then use that information to find the pump that you need. You can narrow your search by speed, discharge and suction size and configuration and horsepower. Once you have chosen the pump that you need, you can purchase it and the install it by following how your current pump is installed. Then you are back in the water for relaxation and fun.